Ever since I got my cat I’ve decided that there is absolutely nothing more creepy than the way she stares at absolutely nothing. She loves to do it when I’m home alone and sit next to me, then stare at absolutely nothing. Of course the thing that has captured her attention is always somehow directly behind me, so I always have to look over my shoulder every five minutes. Whoever thought having pets around is comforting when you’re on your own was out of their mind. Well this lamp shows cats in their true evil form. 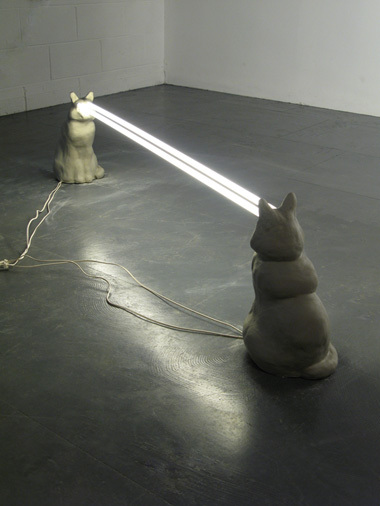 This sculpture/light was created using air-dry clay. It’s a design by Steve Bishop and being a design there is of course no purchase information. The cats are set up staring at one another permanently locked in each other’s gaze. They have a light attaching the two of them towards each other. The measurements are 170 x 30 x 18cm. You can check out the designer’s other works on his site here. can someone say NEEVRENDING STORY?! You must believe!!! It’s not designer… It’s a contemporary artist. Guess what’s the differce. Yeah, one has a bigger ego than the other because thier recognized and the other just works LOL! I’ve heard that cats can see spirits. Maybe it’s not absolutely nothing that’s got your cat’s attention. still,..i wouldn’t buy one either way. i trip over invisible cables stuck to the florr let alone,’hovering’ lights .o.